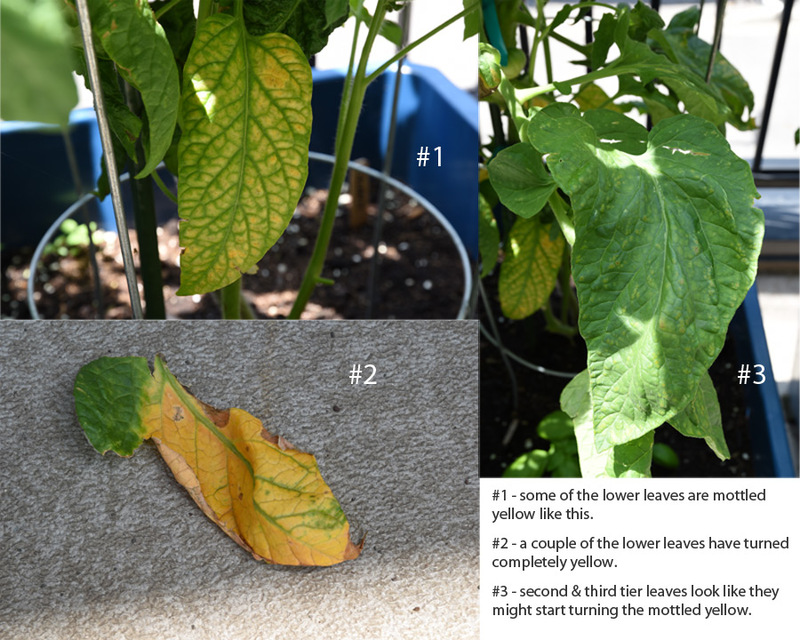 Mottled yellow leaves on tomato plants – what does it mean? The signs are pointing at a magnesium deficiency, though at first I thought it was either a calcium or iron deficiency. According to Yara, a firm that specializes in agricultural products and fertilizers, they suggest that tomato plants require magnesium throughout every stage of growth. Symptoms of magnesium deficiency start at the bottom of the plant on older leaves and then works their way upward. Fruits appear to ripen evenly but maturity is often delayed. Deficiencies may also occur in the middle of the plant during heavy fruit load, but this is usually transient. Tomato plants can suffer from a number of different problems. 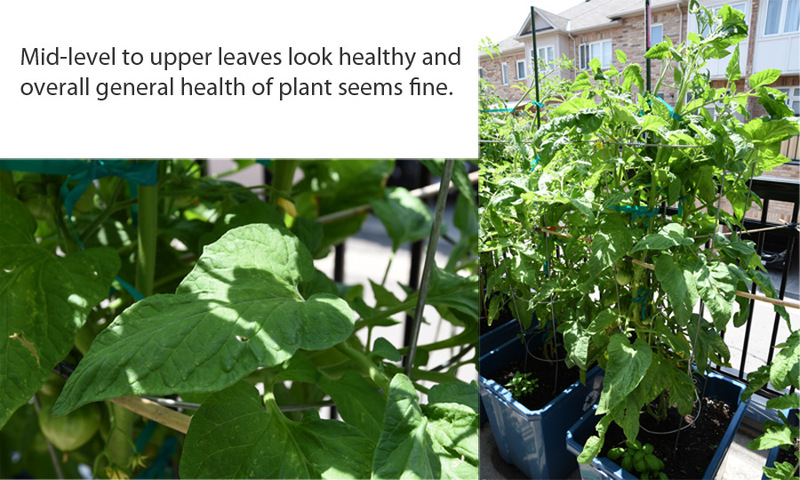 If your plant is showing signs of distress, a good place to start is on Haifa’s Knowledge Centre web page. When doing a Google search to determine the best course of action to improve magnesium deficiency in tomato plants, many sites will recommend the use of Epsom salt. Some of the claims include bushier and greener plants, improved chlorophyll creation, improved ability to uptake nitrogen and phosphorous, and the list goes on. There are many suggestions on how to mix Epsom salt for your tomato plants, during the various stages of growth. A researcher from the University of Washington has refuted some of these claims, and discusses some of the downfalls of using Epsom salt to cure magnesium deficiencies, most notable being that solutions sprayed on foliage can result in leaf scorch. An article published in 2008 on nj.com suggests that you should do a soil test before adding Epsom salt to your soil. My decision? I decided to try using Epsom salt as a spray. I added 15 mL (1 Tbsp) of Epsom salt to water in a spray bottle (1 litre). I sprayed the leaves of my tomato plants early in the morning, while the temperature was still cooler and the plants were not yet exposed to the sun. The plants would remain shaded for the next two hours. It has been eight hours since I sprayed, the plants were exposed to full sun and heat this afternoon, but we had a thundershower that lasted maybe 15 minutes, and the leaves are not showing any signs of distress or scorch. Some people suggest spraying each day for one week. I will attempt this as an experiment to see if there is improvement. I have only noticed this type of cholorosis mainly on the larger Chianti Rose, and the beginnings of it on the Coeur de Boeuf, though the chorosis on Coeur may indicate something different as I do notice some darker markings in addition to the yellowing between the veins.